My name is Jamison Firestone and I was Sergei Magnitsky's boss. I sent you an invitation to view our movie earlier today. Please let me know if you got it. Firestone's most recent efforts to draw attention to the Magnitsky case appear to have been timed to coincide with the visit of Russian President Dmitry Medvedev to the United States for meetings with President Obama. Long-time Jotman readers will be familiar with Sergei Magnitsky, the attorney for Firestone Duncan which was representing the successful American investment firm Hermitage Capital Management on charges of tax evasion and tax fraud. For example, Jotman blogged about Heritage Capital's owner William Browder's description of the deteriorating situation his company encountered operating in Russia. Also, JOTMAN.COM contributor Sanjuro pointed us to story published in the Russian-language Novaya Gazeta. According to the report, in 2005 HCM exposed corruption in a Russian oil company that is alleged to have been owned by Putin. The death of Magnitsky, who colleagues say was targeted by Interior Ministry officers he accused of stealing $230 million, is testing President Dmitry Medvedev's commitment to curb corruption. The Interior Ministry, meanwhile, said it was investigating reports of extravagant spending by an officer, Artyom Kuznetsov, at the center of Magnitsky's death. 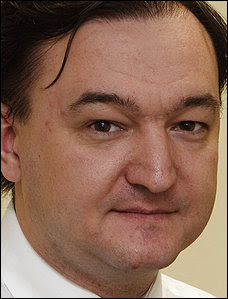 A ministry spokesman said the accusations contained in documents published by Magnitsky's former colleagues on the Internet last week were being taken "quite seriously." ... and then you have Medvedev talking of hitech innovation etc at the St Petersburg economic forum - the forum's motto is "We have changed". Another funny point is that for the duration of the forum, the police seized the print of a crtical report on Putin's presidency (Putin. Itogi. - itogi can be roughly translated as "conclusions", "results" or "the bottomline"). The report was authored by Nemtsov and another dissident and they initially planned to distribute it among the forum guests. The full version in Russian. English translation by David Essel posted at his blog. Most people who have read at it in full, agree that most facts are of common knowledge to Russians and even outside observers. People agree but then say "So what?" Apparently Nemtsov and his co-author Milov (and perhaps many other moderates) do not enjoy much support on the premise that they are lab-grown, controlled "pocket opposition". Gazeta reports that the MVD's Internal Security Dept has started investigation on one of the police officers involved in the Magnitsky case. The investigation was started on Firestone's complaints, he's also quoted by the Gazeta as being not very optimistics about the outcome - he said he was "extremely disappointed" after his communication with the internal investigation people. Interesting details related to the police officer's lifestyle: in the last three years his family has spent over 3 million dollars (mostly on luxury cars and real estate)... Earlier in his interview to R. Amsterdam, Firestone speculated that the officers implicated in the case were rewarded with smth about $6 million, for stealing over $200 million from the state (in this case alone). The main benefeciary of the affair is unknown. Russian commenters on the article failed to notice that even if caught, these officers will be a rather small fish.